In our commitment to help you find products that are both safe and effective, we’ve come up with this list of the best shampoos for sensitive skin after more than 18 hours of intense work. We’ve studied and ranked the products based on their compatibility with sensitive skin, ability to effectively cleanse the scalp and value for money. For multiple skin benefits, Physicians Formula Super BB All-in-1 Beauty Balm Cream is a great BB cream for sensitive skin. Apart from the medium coverage it offers, it also promises to smoothen, moisturize and perfect your skin. You'll love that it has SPF 30, too. If you are looking for a vegan BB cream, we highly suggest Mineral Fusion Beauty Balm. It has a unique blend of natural antioxidants and botanicals to keep your skin younger-looking and healthier. For a long wearing BB cream, Missha M Signature Real Complete BB Crea﻿﻿﻿m is one of your best options. It promises to stay on your skin for 12 long hours. It has really interesting ingredients your skin will surely love, like Gingko Leaf Water. Choose Mizo﻿n Snail Repair Blemish Balm if you are looking for a high SPF rating and a fragrance-free formulation. Aside from coverage, it can also tighten your pores and reduce the appearance of fine lines. Physicians Formula Super BB All-in-1 Beauty Balm Cream offers a long list benefits for your skin. And by long, I’m actually referring to 10 skin benefits. The BB cream claims that it can soften, smoothen and brighten your skin while providing coverage and perfecting it. The product can also soften lines while moisturizing your skin. On top of the benefits it offers, the BB cream is hypoallergenic and free from parabens and fragrance. It comes in a satin-matte finish and offers medium coverage. It’s enough to conceal mild to moderate skin blemishes since it looks and acts more like a foundation. Another plus factor for this product is its SPF 30 rating. It will save you time when you are getting ready for work in the morning since you won’t have to layer two different products on your skin. One issue you might encounter with the product is its limited shades. Apart from that, its texture is also a bit thick for a BB cream. Mineral Fusion Beauty Balm is a great choice for people with sensitive skin since it’s free from fragrance, artificial color and phthalates. Another thing you’ll like about this product is that it’s 100% vegan and cruelty-free. The BB cream has botanicals and aloe to soothe your skin and provide long lasting hydration. It comes in one universal shade, which can be a tad intimidating. However, once applied on the skin, it will blend seamlessly. The BB cream feels lightweight on the skin. It can mask large pores and make your skin tone a lot more even. Apart from the soothing properties, the product also has a unique blend of mineral peptides and natural antioxidants. These components can help you achieve younger looking skin. As for sun protection, it offers a low SPF 9 rating. If you like staying outdoors, it’s a good idea to invest in a separate sunscreen as this won’t be enough to protect your skin against the sun’s harmful rays. Missha M Signature Real Complete BB Cream offers long lasting coverage that can last up to 12 hours. It’s hypoallergenic and noncomedogenic. Apart from these two features, the product is also free from Triclosan, GMOs and mineral oil that can be irritating to sensitive skin. Instead, it has Gingko Leaf Water which is widely known for its high antioxidant properties. It also has amino acid complex peptides and Natural Moisturizing Factor (NMF) to restore your skin’s natural balance. In terms of coverage, the product offers medium coverage and a slightly dewy finish that’s not too oily. Mizon Snail Repair Blemish Balm is a multifunctional BB cream. On top of the coverage it provides, the product also offers skin benefits. It can tighten your pores, boost your skin’s elasticity and decrease the appearance of fine lines and wrinkles. It contains peptides and, yes, snail mucus filtrate to get the job done. The product comes with an SPF rating of 35 which is pretty decent for a BB cream. What makes this BB cream great for sensitive skin, apart from the great ingredients, is it’s free from parabens, artificial color and fragrance. The texture is also nice- not too thick or runny. A little goes a long way for this product. It starts off as white on your skin, but don’t feel too stressed about it. Give it some time and the BB cream will seamlessly blend on your skin. Aveeno Facial Moisturizers Clear Complexion BB Cream came from a brand that has been tested to be sensitive skin- friendly for several years already. It’s hypoallergenic and claims to be oil-free. The cream can help brighten your complexion with a slightly shimmery finish. Because of this property, you have be cautious in using it on oily-sensitive skin. It does, however, fit dry skin since it can add a bit of a glow to your complexion. The product come with soy extract for additional antioxidant benefits. Apart from the said property, it also has the ability to soothe inflammation. Its texture is a bit thick but the pigmentation isn’t that great. If you have dark blemishes you want to conceal, this BB cream might not be enough. But if you have fair skin and just want to enhance your natural complexion, this one can definitely do the trick. For people who have a lot of skin blemishes to hide, foundations is almost always necessary. The makeup product can help conceal, even out and perfect the skin. With sensitive skin, however, wearing a foundation might just be too much. Most foundations are formulated to be occlusive and packed with irritants you might not even know about. This is why BB creams stand out. It’s basically lighter than foundations and feels more like tinted moisturizers. BB creams, apart from providing light coverage, can also do the job of facial serums and sunblocks. They can heal acne and acne marks while minimizing wrinkles, too. Because of these benefits, you’ll practically be saving money and even time. One downside of BB creams is the limited shades available. Unlike foundations that come in several shades and undertones, BB creams usually come in general color ranges, like light, medium and dark. If you are just starting out with BB creams, making the switch can be quite intimidating, especially if you’ve been used to foundations for so long. However, for your sensitive skin, it might just be one of the best things you can do for your skin. Sensitive skin is vulnerable, so you have to make sure you only use legit products on your skin. BB creams have not been in the US market that long so it’s a good idea to really check a product before making an investments. Some BB creams are just marketed that way. But, the truth is, they are actually just tinted moisturizers. Before purchasing, check the product’s ingredients as well as its intended benefits. Although BB creams have potential skin benefits, they can’t solve every skin issue you have. You have to find a specific BB cream that can address your concern. Choose one that has antioxidant benefits if you are looking for ways to minimize your wrinkles. Find a BB cream that has skin lightening properties if you want to look fairer. As you know, BB creams fall between tinted moisturizers and foundations when it comes to coverage. They can help you conceal mild skin blemishes but you can’t expect them to fully cover your dark acne spots and scars. If you think you need better coverage, add a concealer in your routine or just stick with your foundations. For most people, using their fingers for application is the best. It helps sink the product into the skin deeper. Unfortunately, this may not be the perfect method for sensitive skin, especially without proper hygiene. Since your skin is very vulnerable, you have to minimize the chances of introducing bacteria and irritants to it. Choosing a new product to add to your beauty arsenal isn’t as easy as it sounds, especially if it means ditching some products you have been used to. Change, however, isn’t always bad. 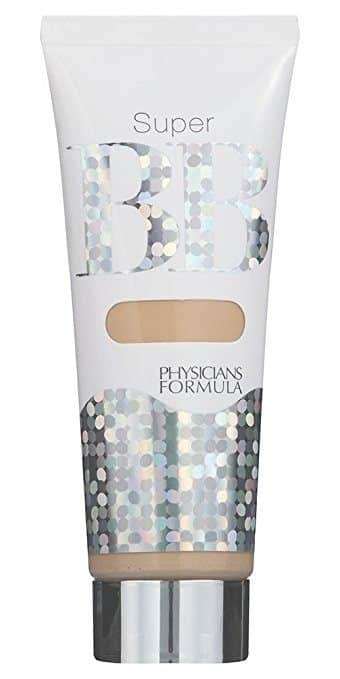 If you are thinking of switching your foundation for the best BB cream for sensitive skin, we highly recommend Physicians Formula Super BB All-in-1 Beauty Balm Cream. It’s loaded with benefits, like sun protection, smoothening and brightening effects on the skin.